CEDAR RAPIDS - As you know I’ve been in Cedar Rapids since Thursday afternoon. As I sit in the press box, five hours before tonight’s game, I thought I’d post some things out of my minor league notebook. Some will be from conversations I’ve had here in Cedar Rapids. Others will be observations, and we’ll also get to an injury update. Having been here for two games (and pre-games), I’ve taken approximately 1,000 pictures so far. Most of them are at least fairly good pictures. But I’d encourage you to “Like” Twins Daily on Facebook where I’ve posted over 100 of them, some of the better ones. Others will be used in reports like this, and the minor league reports, throughout the season. I like to encourage fans of the Twins and minor league baseball to make the trek down to Cedar Rapids. From St. Paul, it takes about four hours to get here. Cedar Rapids has such a rich baseball history going back well over 100 years. You’ll want to spend some time in their ballpark gift shop which also holds the Cedar Rapids Baseball Hall of Fame. The ballpark is beautiful. They do a great job with fan interaction and giveaways. This morning, I spent about 18 minutes walking around the stadium and talking about Cedar Rapids. Take a few minutes to watch and listen to this Twitter Live/Periscope video from earlier today. If you’re a prospect hound, it’s fun to see players before they become big leaguers. Think back to that 2013 Cedar Rapids team, the first year of its affiliate with the Minnesota Twins organization. Players from that team who are now members of the Minnesota Twins include Byron Buxton, Max Kepler, Tyler Duffey, Taylor Rogers, Jorge Polanco. Which players from this year’s Kernels roster will be future Minnesota Twins? Who knows? But it is likely at least two of them will, and maybe seven or eight of them. It’s fun to watch and see them at this level and try to project for yourself. On Thursday night, Tyler Wells started for the Kernels. At 6-7 and 255 pounds, he can be an intimidating guy on the mound. He throws a good fastball in the 91-94 mph range, and he’s got pretty good command of it. He also has a good slider and a mid-70s slow curve ball. He began the inning with five straight strikeouts. He gave up a couple of runs in the third inning, but two scored on a broken bat bloop double that Christian Cavaness dove and missed. I think he’s one to watch. Tonight we’ll see lefty Domenick Carlini start for the Kernels, and it’ll be right-hander Clark Beeker for Sunday afternoon’s game. Andrew Vasquez came on in the sixth inning on Thursday. He is impressive .He’s a big man (6-6, 240), and he throws hard. He has good pop and hides the ball well and has a good slider. To my untrained eye, he looks like a guy who has a chance to keep moving up and being a good reliever. Tom Hackimer posted a 0.58 WHIP in April yet somehow he has already blown three saves. I wouldn't worry about that as he has some really good stuff, and that side-winding delivery will be able to throw off a lot of hitters. The Kernels have three catchers and yet it seems to really work out well. Ben Rortvedt is the 19-year-old high draft pick, so you know he’s going to play. While he hasn’t hit much yet, you can see he’s got a swing that over time will develop well. But behind the plate, he is really impressive. I like to watch catchers, and he just seems to have all the tools. While he’s still got room to grow and will continue to get better, he has the makings of a real fine defender. Let’s start with the arm. He has great throw and catch mechanics, and he threw some absolute ropes to second base to nab would-be base-stealers on Thursday night. As impressive, he really seems to relish the role of leader of the staff. After each inning, he walks in with his pitcher, and I saw them continuing to talk in the dugout. I wouldn’t worry about the offense, though I think that will come. Rortvedt is legit behind the plate. Mitchell Kranson caught on Friday night. He’s a hitter first. That’s not to say he’s not a good catcher. I thought he did real well behind the plate. He too communicated well and blocked a few balls in the dirt. His arm isn’t Rortvedt like, but he has a strong and generally accurate arm. But he can hit. While he hasn’t had a lot of hits in these two games, it’s clear that he has a great approach. He knows the strike zone, but he is incredibly aggressive when he gets a strike. He looks like he wants to damage the baseball, and he’s got good power. In college, Kranson played all over. One year he did catch over 40 games for Cal-Berkeley. Another year, he played mostly third base. He’s listed at 5-10, but he played a solid first base one year for the Bears. He even got time in the outfield. This past offseason, Kranson worked hard. He lost 25 pounds without losing any muscle through workouts and dietary changes. This spring he’s only caught four or five games. He’s played some first and some third, and he’s in the lineup almost every game because of his ability to hit. Caleb Hamilton is another catcher on the roster. He was drafted by the Twins out of Oregon State just last year. He had never caught until last fall at the instructional league. He talked a lot about how much he’s grown to enjoy the position. But he also has played around the diamond. On Friday night, he was at third base. He made a great diving play to his backhand side, near the third base line, Got up and threw a pea across the diamond for the out. He’s played some in the outfield (starting in left field tonight) and first base as well. In college, he played a lot in the middle infield. I tweeted that I talked to Lake County starting pitchers Juan Hillman and Brady Aiken on Thursday night because they both have connection with a couple of top Twins prospects (those stories coming this week). There was another connection. The primary catcher for Lake County was Logan Ice. He was the catcher at Oregon State for three years and the roommate of Caleb Hamilton. Travis Blankenhorn was hit by a pitch on Thursday night, a slider that seemed to just keep coming in on him. He went down. It hit him in the knee, but he was able to stay in the game. On Friday, he had the marks to show it, a huge black and blue bruise. On Friday, he was back in the lineup, though as the team’s DH. On Saturday, he returns to third base. He’s been slumping since early-season success, but on Saturday, he crushed the ball a few times, lining out to right once and having a ball caught at the wall. Lewin Diaz is a big man. He’s not swift, that’s for sure, but he is a very young developing player with a ton of potential. He’s listed at 6-3 and 254 pounds, and that would seem to be accurate. At first base, it’s a work-in-progress, though he does put in the work. He’s a pretty good athlete for his size too. Offensively, he has struggled to connect with some good fastballs, but in the two games, I think he’s got three doubles and a triple. Yes, a triple. I think he’s got a world of offensive potential. Brandon Lopez is a pretty solid all-around player. Drafted last year out of Miami, he has a real professional approach at the plate. He knows the strike zone and does a nice job. He also isn’t afraid to take a real big swing and has some pop. He played shortstop at Miami, but he’s played mostly at second base for the Kernels. That’s because Jermaine Palacios is back. After what had to be a frustrating 2016 season, he is off to a great start this year. He was the Twins Daily Hitter of the Month. Of course I got here on Thursday and his 15-game hitting streak came to an end. But he has stung the ball, and on Friday night, he had a bases-clearing double off the base of the wall in left center field. Defensively, he has looked real solid too. He just looks much more confident this year, or at least right now. I chatted for quite some time yesterday with Aaron Whitefield. It’s still amazing to me that he didn’t play any baseball until he was 17. Before then, it was just fast-pitch softball (and some other sports like soccer and Australian Rules Football). He is a great athlete, at 6-4 and 200 pounds. He can run and he’s got a lot of power. I’ll write up a story on him this week as well. Impressive young man, and he won’t turn 21 until September. As I’m typing this, it’s now 4 ½ hours before the game. The relievers are set up in two groups. JP Martinez is hitting ground balls for pitcher fielding practice to one group on the main field with minor league pitching coordinator Eric Rasmussen observing. Down the right field line, LaTroy Hawkins is working with another group of pitchers (looks like the starters maybe) on pick-off plays at second base. LaTroy Hawkins has been here since Wednesday, and today will be his last day before he heads back to Minneapolis for a while, but he will be back. The players seem to really enjoy it. I was told by one player that Hawkins had a session with the pitchers and catchers and just had the players feel free to ask him questions about anything. What an opportunity for these kids. 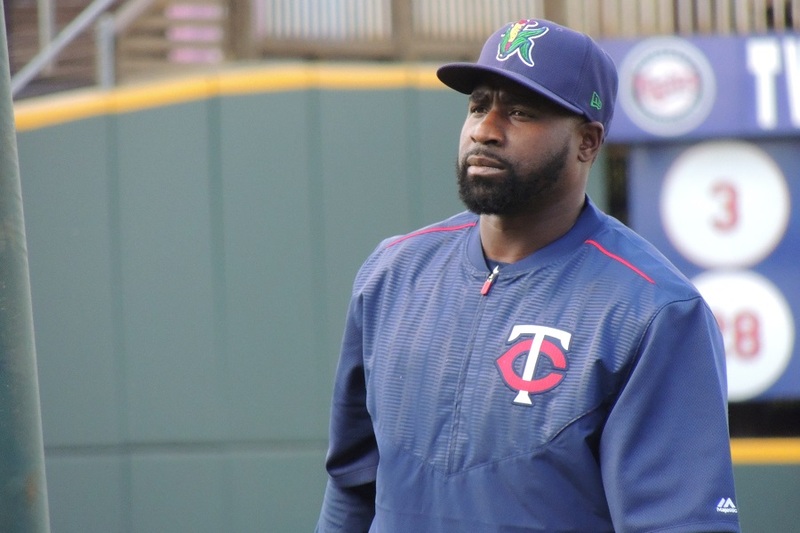 Brian Dinkelman is back for his second season as the Kernels hitting coach. I learned last night that when he got the job last year, he and his family moved to Cedar Rapids, so he’s hear all year around. He is originally from a suburb just outside of St. Louis, so he was very excited last night watching the Blues hold on to a late lead and win their Stanley Cup series. Tommy Watkins is in his first year as manager, and he has this team playing very well right now. While there aren’t a lot of high-end prospects on this roster, they have a good team, and all reports are that Watkins is doing a terrific job. I’ll have a chance to go one-on-one with him later today to see how he’s enjoying this experience. Again, if you ever have a chance to get down to Cedar Rapids, try to do it. It’s definitely worth it. Stephen Gonsalves threw three innings on Thursday. He’s still getting stretched out and is expected to miss three more weeks. That is the same timeline projection for Tyler Jay. Jake Reed is starting a throwing program now and will likely be out about another month. Byungho Park is playing in extended spring training games now. Working his way back from thoracic outlet syndrome surgery, Alex Muren is still working his way back to where he was pre-injury, but he’s getting close. Lewis Thorpe is also continuing to work. He’s healthy but working to get back to where he was. Others who are currently playing in EST and could be back soon, pending roster developments or other moves include outfielder Ryan Strausborger, infielders TJ White and Brian Olson, catcher AJ Murray, and pitchers Cam Booser, Michael Cederoth and Zack Tillery. Henry Centeno is rehabbing his elbow. Yohan Pino is still getting stretched out. Nick Greenwood is supposed to throw an inning down in Ft. Myers today. Well, this is probably enough ready material for a Saturday afternoon. I’m going to go watch some more infielder/pitcher practice and some batting practice. Again be sure to follow me on Twitter, as well as the Twins Daily Twitter account. And “Like” Twins Daily on Facebook. Ben Rortvedt is the 19-year-old high draft pick, so you know he’s going to play. While he hasn’t hit much yet, you can see he’s got a swing that over time will develop well. But behind the plate, he is really impressive. I like to watch catchers, and he just seems to have all the tools. While he’s still got room to grow and will continue to get better, he has the makings of a real find defender. Let’s start with the arm. He has great throw and catch mechanics, and he threw some absolute ropes to second base to nab would-be base stealers on Thursday night. As impressive, he really seems to relish the role of leader of the staff. After each inning, he walks in with his pitcher, and I saw them continuing to talk in the dugout. I wouldn’t worry about the offense, though I think that will come. Rortvedt is legit behind the plate. Rortvedt is my Adopt-A-Prospect so I am always happy to see him written up. Do you agree with my adjective for him that he possesses the highly desirable quality of being "quiet" behind the plate? I imagine him being an umpire favorite. He's just so composed. Hamilton is off to a nice start in CR. Quality stuff here Seth. Thanks for your hard work. Any idea of Lewis Thorpe's ETA? How has he been progressing? I thought Thorpe had been abducted by aliens. This is good news. Thanks Seth. Can't imagine we'll see Jay or Gonsavles in MN this year, if they won't pitch in a game until June. That's a real buzzkill. I think both of those were question marks (in terms of pitching in MLB) coming into the season, so I would agree that this makes it quite a bit less likely. I think Jay has a better shot than Gonsalves of making it up this year, just because he's a relief pitcher. Would the issue with it being later in the season be adding him to the 40 man in August or September is a waste of service time? Does that matter as much with a relief pitcher?